Heart shaped Easy Nutella Truffles only need three ingredients and are so simple to make. 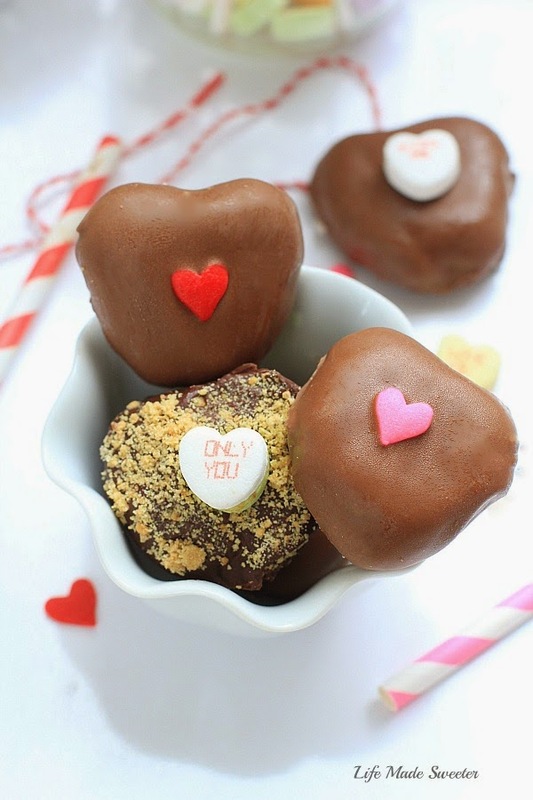 Made with graham crackers – so cute & perfect for Valentine’s Day. Now that I have little ones of my own, there’s nothing more fun to me than getting to spend an afternoon baking with my kids by my side. With Valentine’s Day coming up, I thought it would be fun to make something festive for the occasion. 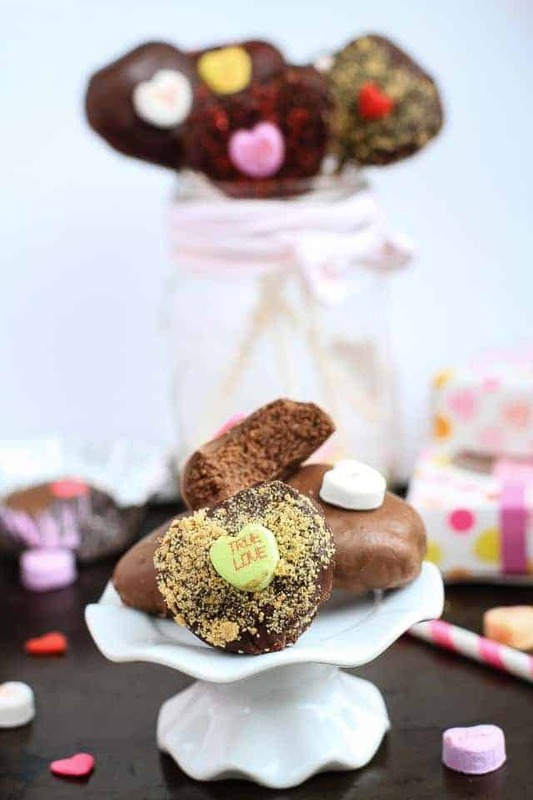 Truffles are always a great way to show someone you care especially when they come in heart shapes. Throw in Nutella and you’re guaranteed to have a crowd pleaser! These Easy Nutella Truffles make a decadent treat and are incredibly easy to make with only three ingredients! Nutella, graham crackers and chocolate. We started by crushing the graham crackers in the food processor until they became crumbs, then we added Nutella until a smooth dough came together. I stuck the dough in the freezer to firm up so that they would hold their shape once I dipped them into the melted chocolate. We made a few into lollipops just by inserting a stick in the middle. By adding a few festive sprinkles and sweetheart candies makes these some mighty special candy grams just for Valentine’s Day. I stuck the dough in the freezer to firm up so that they would hold their shape once I dipped them into the melted chocolate. We made a few into lollipops just by inserting a stick in the middle. By adding a few festive sprinkles and sweetheart candies makes these some mighty special candy grams just for Valentine’s Day. 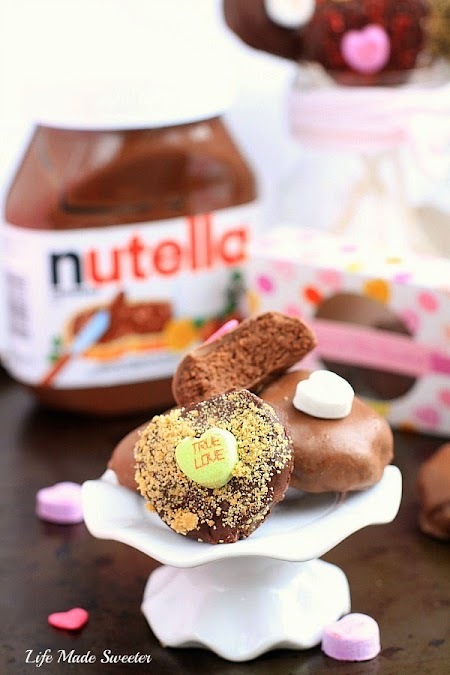 Heart shaped Nutella Graham Cracker Truffles are a chocolaty hazelnut indulgence in every bite. 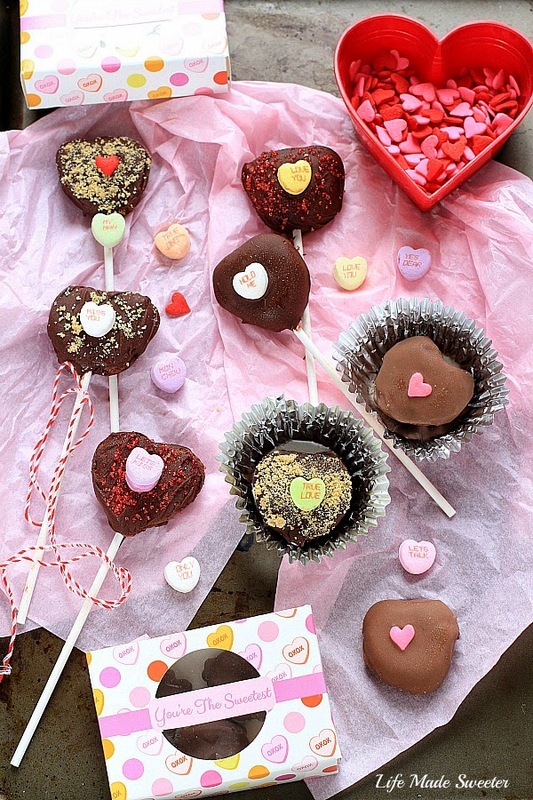 With only three ingredients, they make a simple and easy decadent treat for Valentine's Day. Add graham crackers to food processor and process until mixture resembles crumbs. Start by adding 1/2 cup of Nutella and pulse until dough forms. Continue adding more Nutella and process until dough comes together smoothly. You want the mixture to be sturdy and sticky enough to be able to form balls. Add a little bit more Nutella or cracker crumbs to achieve this consistency if needed. Using your hands, scoop out about a tablespoon of dough and form into a ball and then shape them into hearts. Place on aluminium foil or parchment lined baking sheet and freeze for 30-60 minutes or until firm. Melt chocolate according to package directions or using a double boiler heat chocolate, stirring until melted. Place sprinkles in a bowl. This recipe will yield approximately 14 to 15 Nutella truffles. The recipe doubles easily.